The City of Santa Clarita will unveil its newest public art exhibit titled “Beauty is a Bridge” at the Westfield Valencia Town Center’s “Small Space, Big Stories Gallery” on Wednesday, May 16. 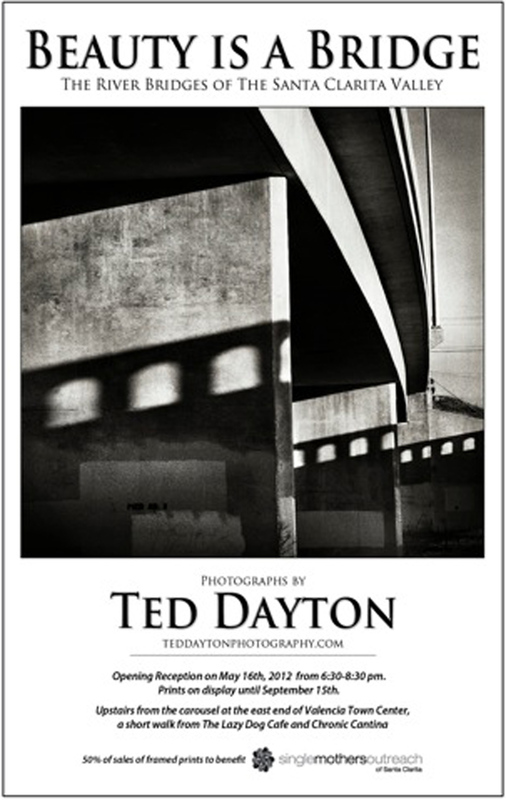 The exhibit, which features the work of local photographer Ted Dayton, will be on display through Saturday, September 15, 2012. The community is invited to attend a free, opening reception with appetizers and live entertainment from 6:30 p.m. to 8:30 p.m. on Wednesday, May 16, 2012. Dayton began the “Beauty is a Bridge” project in February 2011, while crossing the bridge over the Santa Clara River. His photographic journey across the Santa Clarita Valley resulted in a collection of black and white images photographed from unique angles that capture vantage points most people never see. 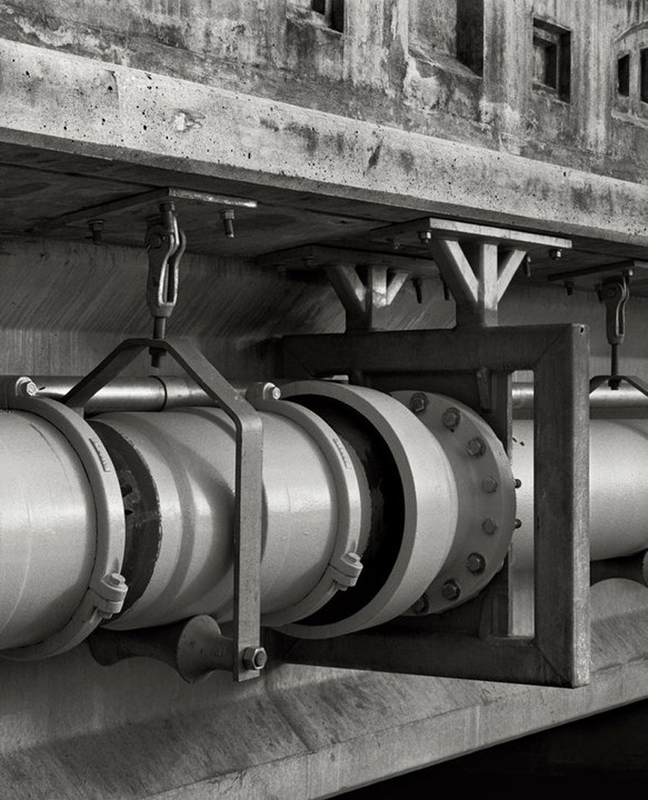 The exhibit features 35 black and white prints from Dayton’s original collection of 175 photographs depicting 27 different bridges in the Santa Clarita Valley. Framed prints displayed at the exhibit will be available for purchase, with 50 percent of the proceeds benefiting the Single Mothers Outreach of Santa Clarita, which supports struggling, single mothers and their families. Community members also have the opportunity to attend a free black and white photo session with Dayton from 8:30 a.m. to 1:00 p.m. on Saturday, June 2, 2012. Participants will park at Lowe’s at 26415 Bouquet Canyon Road, and take a short walk to the Santa Clara River to learn about composition and exposure as they photograph the bridge that initially inspired Dayton’s collection. The workshop ends at City Hall on Valencia Boulevard, where Dayton will teach participants how to process their images using Adobe Photoshop. The workshop is free, but interested participants should confirm a spot by emailing Arts and Events Supervisor Jeff Barber at jbarber@santa-clarita.com. All participants are required to bring a Digital SLR camera, tripod, and laptop installed with Adobe Photoshop. The “Beauty is a Bridge” exhibit and photo session are part of the City’s Common Spaces: Art in Public Places program designed to provide enriching art spaces and activities. For more information about the “Small Space, Big Stories Gallery,” or the City’s Common Spaces: Art in Public Places program, please contact Arts and Events Supervisor Jeff Barber at (661) 250-3779 or visit Santa-Clarita.com/arts.